I follow five major indices closely. They are RUT, DJT, NAZ, DJI and SPX. Two of them, RUT and DJT, are now solidly below their 200D SMA. The remaining three are below their 50D SMA and very close to cross their 200D SMA. We're trading in a bear market now, hence from here forward, rallies are opportunities to add more shorts (Per my plan, I added another round of shorts today shortly after open). 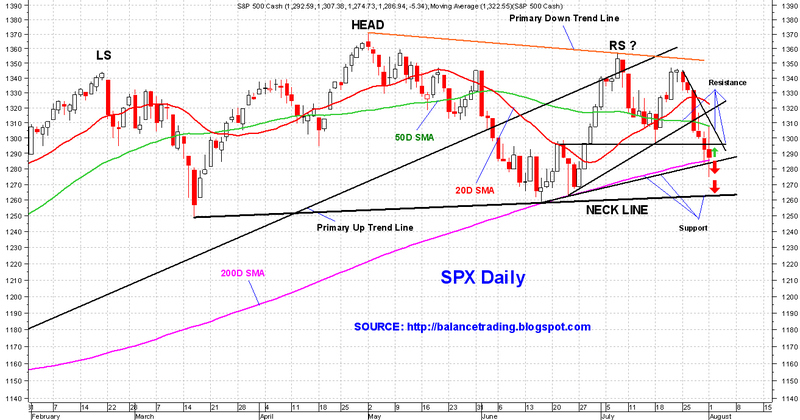 I think there is a good chance that SPX sells off to test the Neckline sometime this week, even as early as tomorrow. 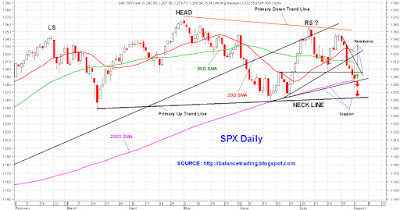 A close below the Neckline confirms the H&S price pattern in SPX. The objective for that pattern is SPX 1150 to be reached sometime in early to mid September.